Ants are fascinating creatures. They have been here for millions of years and can be traced as far back to the age of the dinosaurs in the Mesozoic Era! There are over 15,000 described species of ants and we are discovering new species around the world all the time! The following are our most commonly asked ant questions regarding ant biology. Be sure to also check out at our store the AntsCanada Ultimate Ant Keeping Handbook™ E-Book with information on ant biology, ecology, and evolution. What is the scientific name of an ant? Actually, an ant is not a single species. Ants are in fact a family of thousands and thousands of different species. The family of ants is Formicidae under the order known as Hymenoptera, which also includes wasps and bees. What is the scientific study of ants? Myrmecology is the scientific study of ants. A myrmecologist is a person who studies ants, however most myrmecologists simply refer to themselves as entomologists or biologists because working with ants often necessitates work with and knowledge of other flora and fauna; ants are so closely tied to all the living things around them. What are the life stages of an ant? Ants, like many insects, undergo a process called complete metamorphosis, where they start off as an egg, then hatch into a larva, which then becomes a pupa, out of which emerges an adult ant. What is the life cycle of an ant? The ant life cycle is a little more complicated because ants have special forms of ant known as alates, or reproductive ants. These alates appear in the colony from special eggs laid by the queen usually when the colony passes a certain size. These alates are larger than the worker ants and are born with wings. They are the reproductive males and young queens. During what is called a nuptial flight, which takes place at a specific time of the year, all these alates take to the air and mate with each other, after which the male alates die and the female alates drop to the ground, break off their wings, and venture off on their own in search of a suitable place to start their new colony alone. 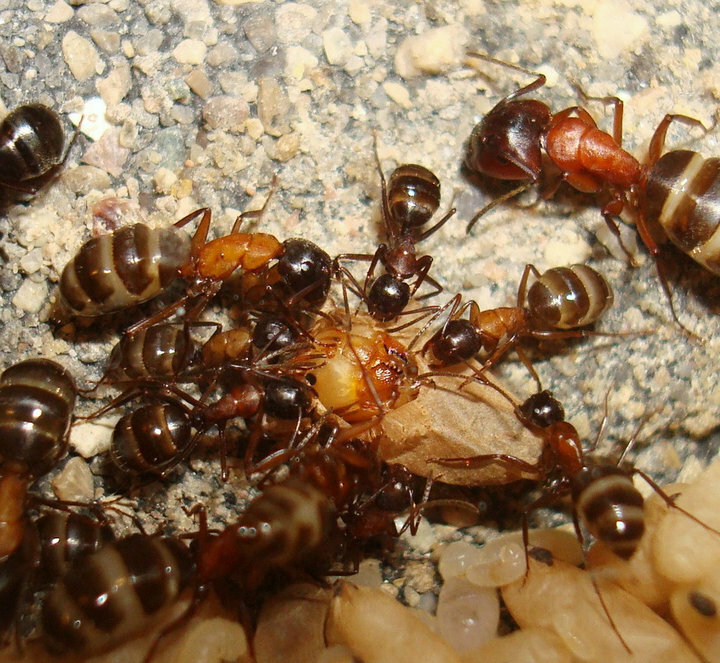 These now wingless queens become the official egg-laying queen of their new colony. Eventually, when the new colony gets big enough, the queen will begin to lay eggs which will turn into alates, and the process starts all over again. How long does it take for an ant to develop from egg to worker? It depends on the species of ant and factors like warmth and temperature. A queen with new eggs that are kept a few degrees above room temperature develop faster. 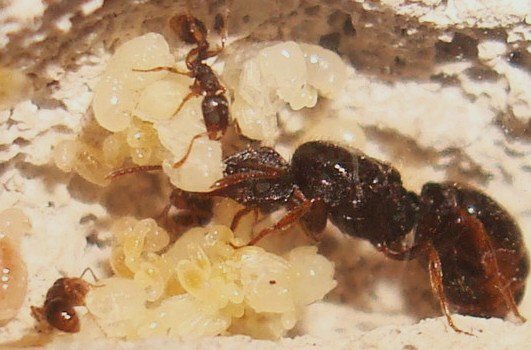 For most species it takes about 3-5 weeks, but for some ants like those belonging to Camponotus take two months to get from from egg to worker. After a newly mated queen settles into her claustral chamber (or test tube) how long does it take for her to lay eggs? In most cases, it takes a queen anywhere between a few hours to a week to lay eggs. Some queens, especially those caught prior to winter, i.e. hibernation season, may hold off laying eggs until after hibernation. These queen ants will start laying eggs by Spring. What is the ant caste system (queens/males/workers/majors/minors)? Ants are social insects that have a caste system of different specialized forms that take on various unique functions. All ants are born into their respective caste and remain in that form for their entire life. There are worker ants, which most people see wandering around above ground. They handle the bulk of the colony’s duties, including cleaning, food collection, tunnel digging, caring for the young, defense, and more. They are all female and are barren. There are also female alates, which are young virgin queens born in the nest and have wings. These become the new founding queens of their own colonies after they mate during a nuptial flight. There are also male ants, which tend to look more like wasps but are typically smaller than the queen alates. Their only job is to mate with the female alates during nuptial flight, after which they die. There are also other denominations of workers in some species, e.g.majors which are specialized larger worker ants often used to defend the colony from attack or tear apart food items, and minors which are smaller worker ants often used for caring for the young. Some highly specialized species of ants even have additional worker denominations like submajors (smaller majors). Ants have a chemical language. They communicate through pheromones. There is a different pheromone for every message an ant might want to deliver to other ants. These pheromones are expelled from glands at various areas of the body. Ants also can create sounds by rapidly rubbing body parts together (a process called stridulation) or in some species drumming on the ground with their head and legs, which causes vibrations which other nearby ants can perceive. Vibrational communication in ants usually involves an attempt to excite or alarm fellow ants. Some ant species like Weaver Ants (species: Oecophylla smaragdina) have very good vision. Others have poor vision and are thought to only see shapes and light. Some subterrestrial ant species that never come to the surface have no functioning eyes at all. Perhaps the most used senses of an ant are the senses of smell, touch, and taste all through the antennae. Ants do not have ears. Ants breathe through spiracles small openings in their gaster (rear portion of the ant). What are the body parts of an ant? Watch this video (and make sure annotations are ON!). The life expectancy varies with the species. Queens usually live the longest. Some species like Myrmica rubra are thought to live only two or three years while other species like some from the genus Formica, can live for 15 years. The record for ant longevity is held by a queen of Lasius niger who, in a German laboratory nest, lived for 29 years. Worker ants usually live for a several weeks to months, while male ants typically survive for a single season. What are some of ants’ natural enemies in the wild? Besides ant-eaters? LOL! Predators include amphibians, reptiles, spiders, various beetles, specialized moth larvae that eat ant young, and surprisingly other ants! Many predators prey on alates (winged reproductive ants, i.e. young queens and males) like birds, dragonflies, wasps, and others. Humans can also be considered enemies when they attempt to fumigate and kill ants, or when habitats are destroyed caused by urban development.